This will prevent Glenn from sending you messages, friend request or from viewing your profile. They will not be notified. Comments on discussion boards from them will be hidden by default. Sign in to Goodreads to learn more about Glenn. At least with Dostoyevsky, if you kill an old pawnbroker, she stays dead and doesn't turn up three hours later crawling around in your apartment. Not so with Kharms. The Old Woman is case in point. The unnamed narrator, a writer I'll call Daniil, spots an old woman holding a clock as he walks through a courtyard. He stops and asks her for the time. The old woman tells him to have a look whereupon he discovers there are no hands on the clock. The old woman peers at the clock face herself and says: it is now a quarter to three. Daniil walks on but this is not the last of the old woman, and that's understatement. Further along, Danill runs into Sakerdon Mikhailovich and invites his buddy for a drink of vodka at the local cellar bar. After which he proceed on his leisurely stroll but then Daniil suddenly remembers: he forgot to turn off his electric oven! He turns round, walks home, takes off his jacket, locks the door and lies down on the couch in order to get some needed sleep before resuming his writing. His rest is interrupted by offensive shouting from urchins out on the street. Danill engages his imagination: those urchins are infected by tetanus and since they are frozen stiff, their parents must drag them home. The urchins recover but he hits them with another tetanus infection and they all croak. Hehehe – serves them right. Ah, the stove is still on! Danill jumps up and turns the damn thing off. He lies down again, this time with pen and paper. Ever the creative artist, he feels a terrible power within. He starts a story about a miracle worker who never once in his life performed miracles. Imagination on fire, Daniil pops up, grabs different objects and starts running around the room, from window to table to oven to window where he can see a man with an artificial leg walking along knocking loudly with his leg and stick. Suddenly, there’s a knocking on his door. It’s the old woman from the courtyard! He’s dumbfounded. The old woman says: so, here I am. The old woman walks in, takes a seat in his very own armchair and tells him to shut and lock the door. Then the old woman orders: kneel. Daniil gets down on his knees. He feels all is absurd. He tells the old woman he should kick her out. Unflustered, she demands that he lie down on his stomach and bury his face in the floor. He obeys. What to do? Speak with the house manager? Cover the old woman with a newspaper? Then he hears the engine driver in the next apartment moving around. That’s all he needs – another tenant finding out he has a dead old woman sitting in his armchair. Daniil lights his pipe, pulls his legs up on his couch, relaxes and ponders his next step. He drifts off into a dream where his hands have turned into a fork and spoon. Moments later, a clay Sakerdon Mikhailovich is sitting next to him in a folding chair. Upon waking, Daniil is filled with joy – the old woman is not in the armchair. Ah, it all was only a dream! He gives a sigh of relief: oh, my good Lord, all the things that can happen in dreams. Well, at least now there's no reason to go to the house manager. But then he catches sight of the dead old woman lying face up on the floor, her dentures out of her mouth and clamping into her nose. What a swine! Danill runs over and kicks the old woman in the chin. Not a good idea – people will think he murdered the old woman. Drats! And on top of it all, he’s starving. Off to the bakery for bread. Standing in the queue at the bakery, Daniil meets an attractive young woman. They strike up a conversation; its love at first sight. Danill invites his beautiful lover back to his apartment. She gladly accepts and off they go. But wait – what will she think once she catches sight of the dead woman? Alarmed, Daniil starts running in the opposite direction. And so the tale continues with many more topsy-turvy happenings. I relayed the opening portion of Danill Kharms’ The Old Woman to share a specific taste of the author’s brand of absurdism. The more Kharms we read, the more we encounter the author’s recurring themes of starvation, falling out of windows, senseless violence, verbal abuse and men and women being hauled off to jail. And Kharms offers no overarching moral judgement - these things just happen as they happen. However, those in power within Soviet Russia were of quite a different mind: they interpreted the author's writing as a slap in the face to all things Soviet. Daniil Kharms faced ongoing harassment up until the day when he was locked away in a mental institution where it is reported he died of starvation at the age of thirty-eight. If your interest has been piqued, as I certainly hope it has, I encourage you to pick up Incidences published by Serpent's Tale, a collection of dozens of the author's shorter fiction along with the 30-page The Old Woman. Additionally, as a bonus, the book also includes Neil Cornwell's extensive introduction to the life and writing of Daniil Kharms within historical, cultural and literary context. We’d love your help. Let us know what’s wrong with this preview of Old Woman by Daniil Kharms.
" As I always say if asked: if it is a matter of space and it becomes a choice between a bed or more books, get yourself a cot and go with more books. " " Susan wrote: "I’m absolutely fascinated. I never heard of this author before and now I’m eager to make his acquaintance." Glad I did my job as reviewer Susan wrote: "I’m absolutely fascinated. I never heard of this author before and now I’m eager to make his acquaintance." Glad I did my job as reviewer, Susan. I think you will be pleasantly surprised with any of the author's 22 novels. Many are as short as 80 pages - a day's read. Escher's Loops is his longest novel. ...more "
" Ilse wrote: "Wonderful introduction to this poet, Glenn - which made me wonder if he was related to the singer Angel Parra, to whom I used to listen a Ilse wrote: "Wonderful introduction to this poet, Glenn - which made me wonder if he was related to the singer Angel Parra, to whom I used to listen a lot in my youth (eager to learn Spanish :-). And yes, I fou..."
My pleasure to share a brief introduction to Nicanor Parra's poetry - a new find for me. And thanks so much, dear Ilse, for doing a bit of research on the Parra family. Isn't that something - you listened to Angel Parra sing her songs. Wow! Four generations of renowned artists in the family. Perhaps a good thing - sounds like having Nicanor as a relative would pose its challenges. ...more "
" Miriam wrote: "We had a public meeting about what people wanted and then some people volunteered. It's mostly the same half dozen of us who have some Miriam wrote: "We had a public meeting about what people wanted and then some people volunteered. It's mostly the same half dozen of us who have some relevant experience, and a back-up list of people who show up ..."
Makes sense. And if you share specific relevant experience with others in the group that is a basis to have some great interaction. I recall years ago when I played renaissance wind instruments in a consort, we constantly talked about the music we were performing. Likewise when I was part of a physical theater troupe. ...more "
" HBalikov wrote: "Are there any ways, Glenn, that the author identifies with "the explorer?"" Great question, H. Indeed, I suspect many the time Donald HBalikov wrote: "Are there any ways, Glenn, that the author identifies with "the explorer?"" Great question, H. Indeed, I suspect many the time Donald Barthelme felt he was a stranger in a strange land, either when he was walking the streets of New York City or when he was living in a suburb in Texas. Of course, Donald was not nearly as, shall we say, uncultured, as the tale's explorer but there was equal amount of kooky and disturbing happenings back in the 60s as the explorer came upon when in New Paraguay. ...more "
This Penguin Classic covers six Roman lives - Marius, Sulla, Crassus, Pompey, Caesar, Cicero - written by Platonist philosopher Plutarch (AD 46-Ad 120), the great biographer from the ancient world. "His natural abilities made him altogether remarkable and won him such a name and reputation among the other boys that their fathers used often to go to the schools to see Cicero with their own eyes and to observe the quickness and intelligence which he showed." --------- To be such a virtuoso of language, adults flock to your school to listen to you speak. So telling about the Greco-Roman world: a supreme value on intelligence and verbal acumen. In our modern world, our most immediate association with a youngster having virtuoso talent would be playing a musical instrument, usually violin or piano. The implications of the difference are worth pondering. "Elocution and delivery were an important element in his powers of persuasion. He used to ridicule those who were given to shouting out their speeches and said that, just as lame men rode on horseback because they could not walk, so these orators shouted because they could not speak." --------- Ha! Think about this the next time you witness a politician or public figure shouting at the top of their lungs. Would the person speak with more subtlety and eloquence if they really had something insightful to say? "In Rome itself there were most alarming revolutionary tendencies - the result of the unequal distribution of wealth." -------- Ah, the bane of the "civilized" world since we as a human species left hunter-gatherer communities and began agriculture and started accumulating wealth: the haves and the have nots. It was only a matter of time before a thinker like Marx came along. "Cicero, more than anyone, made the Romans see how great is the charm which eloquence confers on what is good, how invincible justice is if it is well expressed in words, and how the good and efficient statesman should always in his actions prefer what is right to what will win popularity, and in his words should express the public interest in a manner that will please rather than provide offensive." 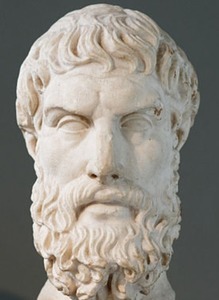 --------- The dream of having a philosopher as a political leader goes back to Plato. Occasionally, as in the case of Cicero, this much heralded combination was actualized. "The conspirators, however, were unbalanced characters who seldom met together without wine and women, while Cicero was following their schemes with patient care, with sober judgment, and with exceptional intelligence." --------- Plutarch is a philosopher and his chapter on Cicero serves as a shining example of what a wise person in the political sphere can achieve. "At this time, Cicero was the most powerful man in Rome. However, he made himself obnoxious to a number of people, not because of anything which he did wrong, but because people grew tired of hearing him continually praising himself and magnifying his achievements." -------- Alas, one with great intellect and strength of character can still have shortcomings; for Cicero it was his habit of continually patting himself on the back. Some things never change: people don't want to hear it. (Plutarch includes a couple dozen of such comebacks - one of the prime reasons to read his life of Cicero). "His ability to put things cleverly would often lead him to forget good manners. . . . Wanting to underscore Cicero's humble family origins, an aristocrat by the name of Nepos asked Cicero repeatedly, "Who is your father?" Cicero replied, "I can scarcely ask you the same question since your mother has made it rather a difficult one to answer." - Nepos's mother being a lady whose reputation for chastity was not high." --------- It's one thing having a Jonathan Winters/Robin Williams-like sharp wit, but if you don't want a gaggle of enemies, you would be well to employ your tongue with discrimination. "He occupied himself also in writing and translating philosophical dialogues and in rendering into Latin the various terms used in logic and in natural science." --------- Not only was Cicero a leader and hero of his country, dedicating a huge portion of his life as a public figure, but he had the ability to render Greek philosophy into Latin and thereby make the wisdom of the Greeks accessible to his countrymen for generations. We’d love your help. Let us know what’s wrong with this preview of The Fall of the Roman Republic by Plutarch. The new frontier of postmodern Paraguay requires a fearless explorer to not only sport a safari hat, beard, custom-fit safari shirt and close-fitting khaki pants but also be well-versed in the latest postmodern writings of Jean-François Lyotard, Jacques Derrida, David Foster Wallace and, of course, Donald Barthelme. Those Spanish speaking natives damn well better be ready! Paraguay is a Barthelme snapper told in fourteen specifically labeled brief chapters, a short-story I included as part of a previous review but I truly love it and think this snappy snapper deserves its own write-up. So, in keeping with the adventurous nature of the story, below are a batch of my own markers as we follow our bold, gusty pathfinder roaming among the uncharted vistas of postmodern, postcolonial New Paraguay. “At the summit there is a cairn on which each man threw a stone, and here it is customary to give payment to the coolies. I paid each man his agreed-upon wage, and alone, began the descent.” Not on a map, not in South America, our narrator had better be alert as he embarks solo into a country never before glimpsed by such a lover of the fresh and the new. Although we are very much rooted in the world of the postmodern, he still refers to his workers as “coolies” – such a racist, colonial term. Some things die hard, if they ever die at all. What is an adventure to an exotic land without the appearance of a beautiful exotic woman? Sure enough, the first person he meets is “a dark girl wrapped in a red shawl.” Along the lines of coolie, right out of those sexist colonial days, he refers to her not as a young lady or a woman but as a “girl.” And, turns out, not only is this woman, Jean Mueller by name, exotic in looks but she is also highly cultured. After leading him back to her large modern house and showing him his room complete with desk, bookcases and fireplace (he is the guest of both Jean Mueller and her husband, Herko Mueller) the narrator tells us she plays a sonata by the composer Bibblemann on the piano. Sidebar: There is no such composer with the name Bibblemann. Probably the narrator misunderstood the name she gave him (Liebermann, maybe? ), which is not surprising since this American appears a tad uncultured. This fact foreshadows a role reversal: in many respects, the civilization of the natives is much more culturally sophisticated and technically advanced than the explorer's. We learn there are adjustments the inhabitants of Paraguay make in response to modest changes in weather and a few other oddities then something quite striking: Herko Mueller, who is, by the way, fond of zipper suits in brilliant colors: yellow, green, violet, is by profession an arbiter of comedy, something like an umpire, where members of the audience are given a set of rules and the rules constitute the comedy. What comes to mind for me is competitive team improv comedy. Anyway, Herko goes on, “Our comedies seek to reach the imagination. When you are looking at something, you cannot imagine it.” So, perhaps there is a good bit of miming peppered in with the improvisation. Or, maybe the men and women of Paraguay are quite advanced philosophically, keenly aware of the nuances of phenomenology and the philosophy of perception. Judging from this scant bit of information, their comedy sounds quite intriguing, certainly more captivating than the usual TV game shows we have north of the border. A government error causing the death of a number of men and women sounds like it could have been from a Chernobyl-like radioactive fallout. The narrator’s and also Herko Mueller’s words to explain the event are unsettling, as if they are using language to cover-up an avoidable tragedy, similar to when the military refers to the death of innocent civilians as “collateral damage.” When you hear someone say, “An error has been made” watch out, someone or some institution doesn’t want to accept responsibility. Although Paraguay strikes me as very postmodern, there is that lingering noisome bureaucracy. Unsettling also is our explorer’s description of postmodern Paraguay art, with words like “rationalization process”, “quality control”, “central and regional art dumps” smacking of a kind of Marxist or government control. And the art process includes things like translation into symbolic logic (whatever the hell that means! ), minimization and being run through heavy rollers. The final result? Two are mentioned: Sheet Art and Bulk Art. And what you may ask will such art look like? For me, at least in terms of the feeling tone of what is described, two artists come to mind: David Judd and Richard Serra. Our bold gallant continues on, reporting on a number of other postmodern Paraguay innovations, things that would remind us of tanning salons, white wall space, softening of language with blocks of silences, health patches, and a form of justice (or injustice) as in “There are crimes but people chosen at random are punished for them. Everyone is liable for everything.” This last point underscores how Barthelme's Paraguay might be a great place to visit briefly, but I wouldn't want to life there. Not to mention not wanting my art run through those heavy rollers. Zoran Živković acknowledges the complexity in Escher's Loops requires a very attentive and patient reader. The Serbian author goes on to say, "I tried to do in fiction what Escher did in his paradoxical weird drawings." Indeed, we read about men and women along with the stories those men and women tell about men and women and the stories those men and women tell about men and women and the stories those men and women tell, all swirling, looping, stepping and interlocking as if alternately in an Escher tessellation or Escher spiral or walking on an Escher stairway. Fortunately, we don't have to keep names straight as characters are identified strictly by occupation - several from the list: lawyer, dentist, mailman, undertaker, butcher. In terms of structure, Escher's Loops is 350-pages divided into four parts: The First Loop, The Second Loop, The Third Loop and The Fourth Loop. Each loop contains nine chapters. The Second Loop is longer than The First Loop, The Third Loop is longer than the Second Loop and, at 175-pages, The Fourth Loop comprises half the book; in other words, The Fourth Loop is exactly the same length as The First Loop, The Second Loop and The Third Loop combined. I suspect you can guess why there's good reason for the progressively longer length of each successive loop. That's right - elements from the previous loop or loops are reintroduced and recombined as we move through the loops. Does this sound like a good bit of mathematical precision? Yes, of course, it does. However, let me quickly add, each and every story in Escher's Loops contains the simplicity and charm found in the author's other novels. By way of example, we can begin by taking a look at the actual stories within the first chapters of The First Loop. Chapter 1: A surgeon is about to enter an operating room where he’s urgently needed but halts in front of the double glass door. A powerful memory roots him to the spot. Those who know something of the surgeon’s life would assume he is recalling the one stain on his career - years ago, in this very operating room, he left a pair of surgical tweezers inside a young woman. However, this is not the case. The surgeon is recalling a much less dramatic incident: despite the fact he hates going to weddings, he attended a colleague’s wedding where the ceremony was delayed due to the absence of the priest. An uneasy tension pervaded the church until, in her agitation, the bride stamped her foot on the stone floor. All fell silent and the bride turned and glared at him, a glare the surgeon interpreted as a military order. He nearly ran to the back of the church where he discovered the priest alone in his office standing straight at attention, cue in hand, rooted to the spot next to a pool table. If he knew the priest better, he would have assumed the priest was recollecting the traumatic memory of being overcome by terrible stage fright during his first wedding ceremony. But this is not the case. The priest is recalling a much different memory. Chapter 2: The priest’s memory: Our man of the cloth remembers an incident at a theater he attended regularly where he developed a keen interest in watching a particular actress. In the middle of a run of one play, the actress was struck dumb and stood motionless on the stage. The audience’s discomfiture at the unexplained gap was palpable. Suddenly, the priest popped up from his seat and began vigorously applauding. A moment thereafter, the audience joined in. The sound of the audience’s thundering applauds jolted the actress out of her trance and the play proceeded without a hitch. In the days thereafter, everyone assumed the actress’s momentary lapse was caused by the empty seat in the front row that evening. They supposed she was in a romantic relationship with a handsome young man who usually occupied the seat. Chapter 3: But all were mistaken – what completely threw the actress off was recalling a traumatic memory: as a little girl she watched as firefighters fought a terrible blaze that engulfed a two-story house in her neighborhood. A terrified old woman appeared at a window in an attic. A ladder promptly swung over from one of the fire trucks and a beefy firefighter quickly climbed the ladder to haul the woman down, all to the cheers of the crowd. But then, amidst the flames, the firefighter climbed the ladder a second time, entered the window and rescued a parrot. Third time up and the tension mounts: there's a delay after he entered the attic. Finally, he emerged but halfway down the ladder the firefighter halted as if frozen. The crowd turned their heads away since the building was about to collapse in flame, meaning certain death for the firefighter. But the little girl started to sing. At that very instant, the firefighter snapped out of it and, just in the nick of time, quickly climbed down to safety. His fellow firefighters thought the little chest he was carrying down the ladder was to blame, a chest that prompted the firefighter to think back to an incident when he was a lighthouse keeper and discovered a mysterious chest. But the firefighters were wrong. It was an entirely different memory. Clicking into the author's storytelling rhythm, we are not at all surprised when the next chapter begins with that fateful memory in the firefighter's past. Let's pause here and recount a key idea behind Escher art: intricate fitting together and repetition of complex figures in elaborate patterns. By what I've noted above, one can easily detect several patterns emerging: characters stunned into recalling a powerful past memory, others' misattribution of the memory, and, as a literary grand finale, the memory leading into another story. And this is only The First Loop! The Second Loop introduces sets of two people confined in a small space - to take one example: a lawyer and older gentleman wearing a Frosty the Snowman costume trapped in an elevator when the power goes out. What to do? Tell stories, of course! And the stories in The Second Loop include men and women from The First Loop pausing to engage in conversations with God. The Third Loop both introduces new characters and cycles back to men and women now familiar to a reader. Additionally, two new twists are added: suicide attempts and the appearance of an elderly woman in a green coat and matching pillbox hat and shoes who has her own tales to tell of attempted suicide. Finally, in The Fourth Loop, we have the characters reappearing in different roles and unexpected activities and more generous helpings of Zoran Živković storytelling magic so imaginative it boarders on the impossible, reminding a reader of the art of - of course, M.C. Escher! We’d love your help. Let us know what’s wrong with this preview of Escher's Loops by Zoran Živković. This is where we will post our videos, and our songs. Take a look at Glenn’s Year in Books. The good, the bad, the long, the short—it’s all here.